Weekend View - Welcome to the weekend view. Where it is all random all the time. Where it is all random all the time. It might have happened. Another 10 foxgloves being added to the garden. Yes, I have a ton already. The softest mostly subtle rosy color -absolute perfection. Mostly the ones we have seen this year are the rose color- which are kind of like a purple really. But my husband bumped into peach and white- which are my favorites- and he brought some home to mix into the greenhouse cottage garden. I took a drive to Ikea last week in order to stock up on some of the items I seem to buy every year. 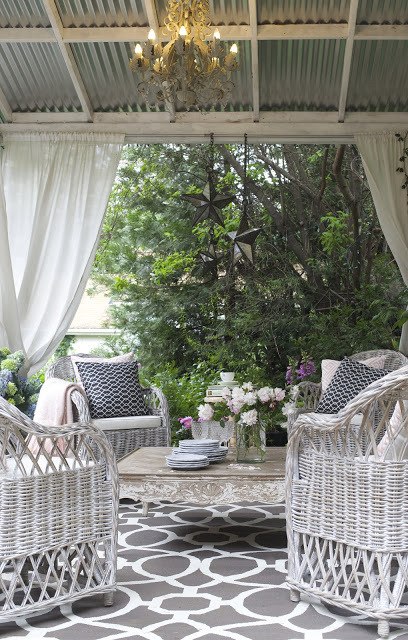 Curtains for the back patio, candles for tucking into pea gravel and willow baskets. Something that you might not know about Ikea curtains- aside from the fact that their curtains are super inexpensive- something that I love about them is that they are automatically extra long. They make them that way so that you can hem to whatever length you would like. But for the patio- they are a near perfect drop landing just above the gravel. This is an older photo- but you get the idea of where they are. Summer patio update coming your way soon. I shared a peek at some behind the scenes photography I was working on the patio- with a sneak peek of the lion fountain area. 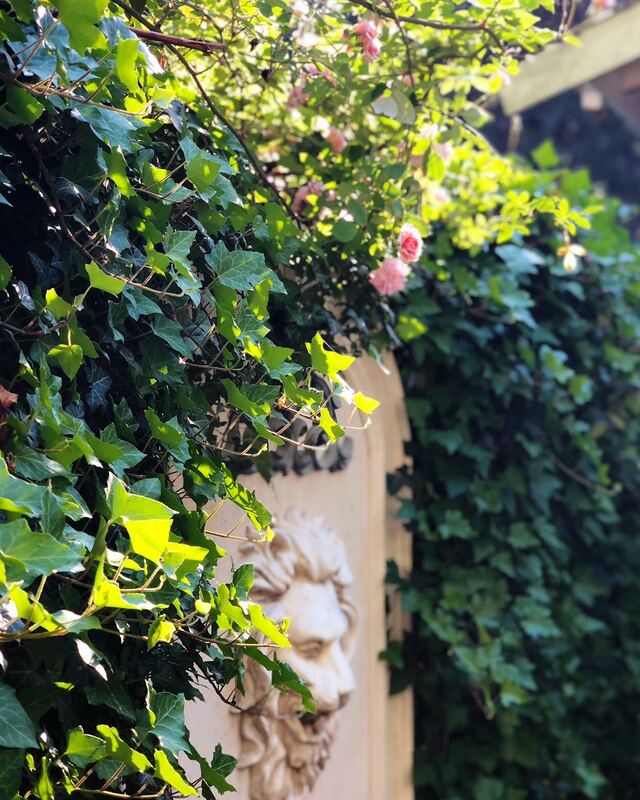 It is a favorite spot- and the ivy and roses are in full force right now- which makes it even more enchanting. Several questions about the lion fountain- it is somewhat older now-and is made out of stone mostly. And something else with tons of questions- these pretty little blooms. Going to be sharing a closer look for a gardening post update. If you follow me on Instagram, then you probably know that Mr. Weenie had surgery for a blockage they discovered and unfortunately passed after surgery. There were complications and what he ate caused a major issue. dogs eat so many things they should not and some things are much more dangerous than others. So many of you have fallen in love with Mr. Weenie over the years when I have shared his night time shenanigans. I appreciate all your notes and messages about him- so I wanted to share the update. 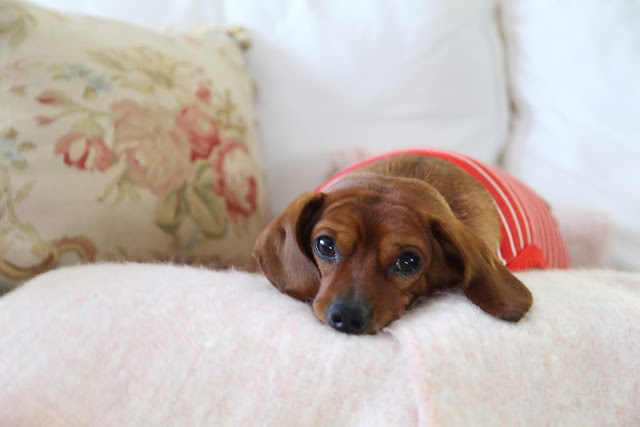 Mr. Weenie was my daughters dog and one of her best friends so it has been particularly hard for her. He was such a sweet funny guy and we all miss him so much. 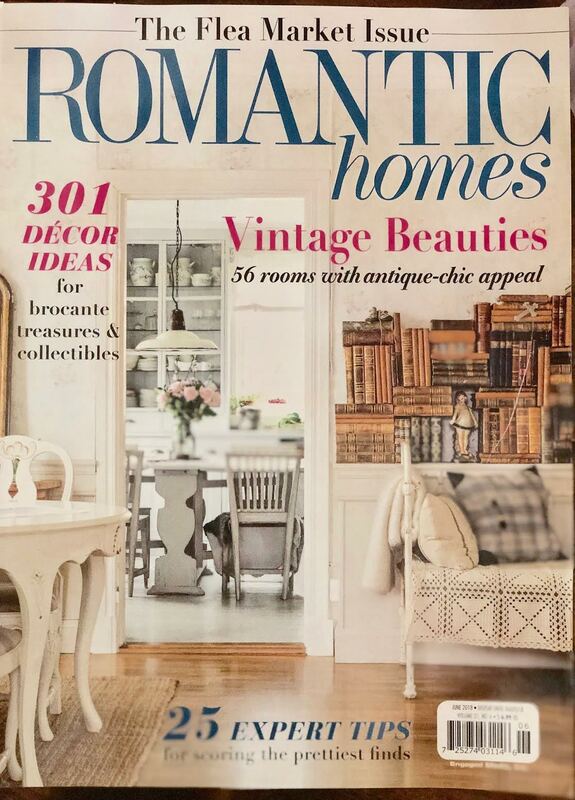 The latest issue of Romantic Homes in on newsstands right now- and it is chock full of flea market goodness. I shared a few contributions this month- and you will see some familiar faces and fabulous style included in the features. and a few fun photoshoots I am working on behind the scenes over here. and a fresh update in the house that is kind of fun. Mr. Weenie will be missed:(. I have little dogs and had some scares of what they put in their mouths. I love the lion fountain amongst the roses and ivy, very beautiful. Yeah, it was something we had no idea he ate and that didn't show up on the x-ray right away- which is why he didn't have surgery for a few more days. Dogs get into everything it seems! Beautiful post, Courtney! So sorry about Mr. Weenie. Losing a pet is so hard. 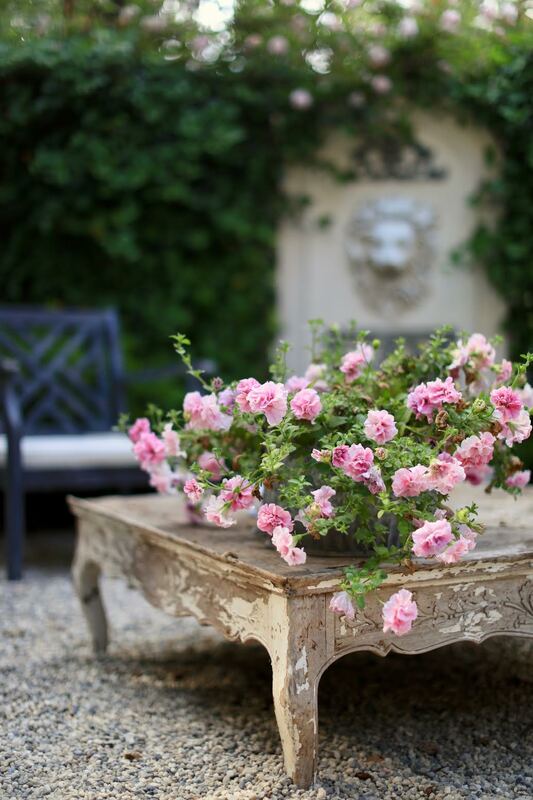 Love the lion fountain with your roses...and the foxglove are gorgeous! Loving the ikea staples that you shared. 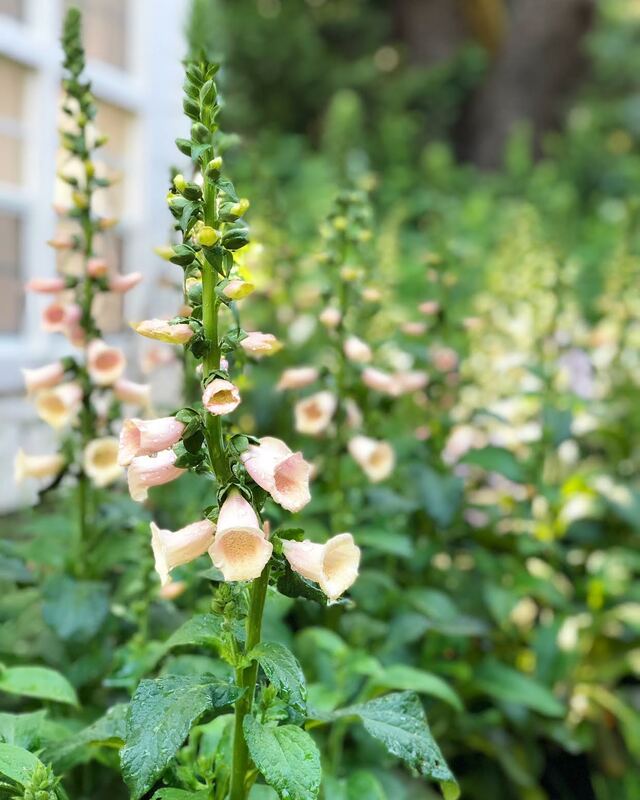 But the peach foxgloves have me on a hunt now! The peach foxgloves are amazing- you will love them. I so did not expect that about Mr Weenie. I am so very sorry. Thinking especially of your daughter and sending lots of pet loving love. We thought he would be okay after the surgery. :( Thanks Cassandra. Love your blog...beautiful pics and enjoyable posts. So sorry to hear of your sweet little dog. :(. Love your posts, been following for years.....you have done so well, and I am so happy for you in all your new adventures...I feel I have missed some posts, and I have a harder time on your website to find things I have missed..any suggestions to help me not miss anything? So sorry to hear Mr. Weenie has cross the Rainbow Bridge. Some people don't understand that losing a pet can be as painful or more painful than losing a relative or loved one. My heart goes out to your daughter and her whole family. Thank you for sharing your love of peach. I grew up next to a peach orchard and Peach roses were always a favorite of mine, especially the Cinderella Rose. I recently was sent a photo of peach peonies, if you're interested. Didn't know they came in that color. So sorry to hear about your sweet puppy. The loss of a special dog is like losing a child. Our prayers are with you and your family.